There is a big difference between Saying you are the Trusted Resource for Renovation Lending, and actually Proving it. We believe that licensed FHA 203k Lenders can help lead the way in stabilizing local real estate neighborhood values while creating greater employment opportunities for the construction industry by educating homebuyers and real estate agents about the many benefits of renovation loan programs. The 203k loan is just one option of the many popular rehab loan programs that an experienced FHA 203k Lender will have access to for your purchase or home improvement refinance. 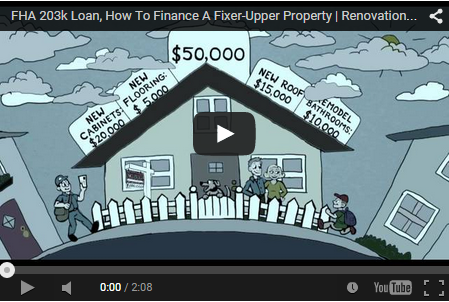 Q: How do you determine the best loan program for a renovation project? There are a number of home improvement loan options ranging from FHA 203(k), Conventional Fannie Mae HomeStyle, VA renovation for eligible Veterans and even Jumbo Rehab loans for high cost areas. Once we get a picture of the borrower’s lending scenario, we start drilling down on the property and home improvement requirements to determine which loan program best matches short and long-term financing goals. For example, an FHA 203(k) might be better if you are buying a home and want to keep expenses lower, while a Fannie Mae HomeStyle tends to be a better option if you are refinancing and already have equity or want some more luxurious upgrades that FHA doesn’t finance. Q: What if my real estate agent is new to rehab loans or feels they are too difficult? We work with many real estate agents who love renovation loans because it creates many more options for helping their buyers find the right property by removing traditional barriers such as outdated kitchens, old flooring and dirty walls that need a fresh coat of paint. The 203(k) can be especially useful in the case where a borrower is already seeking an FHA loan due to the lower down payment and flexible credit qualifying standards. It allows buyers to search for a property at the right price and in an area they desire, and then make it their “home” by adding their own personal touches and energy efficient upgrades. Your agent is just looking out for your best interest by avoiding a loan program they may not be confident with. We’ll work closely with them from the very beginning to show them how to present offers, search for the right property and follow our lead through the entire funding and rehab process. Keep in mind that simple renovations may take less than a couple of weeks, which means that you get to move into the home you really want without having to sacrifice in price, location or appearance. Q: Are home improvement loans more expensive than traditional financing? Not necessarily if you factor in the new features, any energy efficient money saving upgrades and the ability to purchase a home in a better area. Keep in mind that a 203(k) loan will allow you to buy what’s called an “unisurable” property and finance the necessary renovation work in the original purchase loan. For example, a foreclosure where the previous owners literally took the kitchen sink when they vacated the property wouldn’t meet traditional loan programs guidelines, making the property only available to cash buyers who would have to invest their own out-of-pocket money to bring the property up to code. A property like this might be listed at a discount due to the limited number of potential buyers who would be willing to consider spending that type of cash to make it move-in ready. You could purchase that home with a 203(k) loan and save your out-of-pocket money by financing in all of the upgrades. Another point to consider is that rehab loan program rates are just as competitive as traditional financing in most cases, so you’ll still have a monthly payment on a property that fits your budget. The foundation of Rehab Loan Network is built on a belief that a dedicated group of 203k Renovation Loan Experts can combine their experience and resources to raise the standards of professionalism and education within the rehab lending industry. RehabLoanNetwork.com is a national expert network of 203k lenders who specialize in rehab loan programs that provide homebuyers special financing options for fixing up properties. To ensure a successful Home Renovation project, participating real estate professionals require special training on the procedures and changing lending guidelines that impact how and where loans get funded. CLICK HERE to submit a contact request form online, or feel free to Call us @ (844) 204-2035 to speak with a licensed renovation lender directly.